Just a quick card for today. I made this card using the Get Sketchy challenge. I moved the sentiment because I just didn't like it up there by the ribbon and buttons. 4. Fairy Fun Friday: Embossing. How pretty! 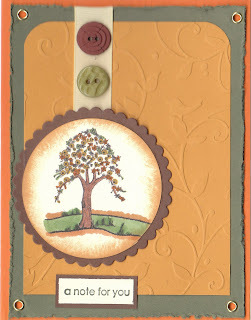 Lovely tree image and the embossing really looks fabulous! thanks for joining us at Fairy Fun Fridays! What a lovely card, thank you for joining in my Colours of Autumn theme at Allsorts this week and good luck. Very pretty! Perfect colours together - love the fall theme. Lovely details!